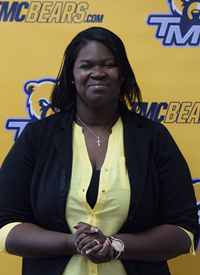 The Truett-McConnell Bears Volleyball Team and Athletic Department announced early this week the recent hire of their new Head Coach, LaKisya Killingsworth. Killingsworth joins the Truett-McConnell Coaching Staff after serving as the Head Women's Volleyball Coach at Delaware State University since 2013. Killingsworth noted, "I am honored and blessed to have this opportunity to coach these young ladies. I am also excited to lead the Christian charge that not only Dr. Hall and TMC has put in front of me but God as well. We have a lot of great talent and I know with hard work and prayers we will build to be successful and bring championship to Truett McConnell. I want to thank God, my husband and family for supporting through this transition. I also want to thank Truett McConnell and Dr. Hall for believing in me and affording me this opportunity to coach again." As the Head Coach at Delaware State University, Killingsworth had 18 players receive All-Academic MEAC and 10 players on the Dean's List. In the 2013 season, Delaware State ranked third in the Mid-Eastern Athletic Conference in blocks (1.87 pg) and fifth in service aces (1.42) among the 13 team league. In addition, Killingsworth had five players earn MEAC Commissioner's All-Academic Team during her first season. Before joining the Lady Hornets of Delaware State University, Killingsworth had a plethora of coaching experience. Prior to accepting the position at Delaware State, she served the previous two years as the Assistant Coach at Mid-Eastern Athletic Conference rival Bethune-Cookman University. As the assistant coach, Killingsworth helped develop All-MEAC First Team and Second Team athletes. Killingsworth held other coaching positions throughout the years, including: Assistant Coach for USAV Florida Region High Performance Program (2012-2013), Head Coach and Assistant Coach at The Volleyball Academy (2008-2012), Assistant Volleyball Coach at Winter Springs High School (2008-2010) and Coach/Counselor at the University of Florida Summer Volleyball Camps (2005-2007). Before entering her coaching career, Killingsworth was a standout player at the University of Florida from 2004-2007. During her playing career at the University of Florida, she helped lead the Gators to three Southeastern Conference (SEC) Tournament Championships, four SEC regular season titles and four NCAA Tournament appearances, where she was named 1st and 2nd SEC Team. She was named to the 2005 American Volleyball Coaches Association All-American Team and was selected for the NCAA Championship All-Region Team in 2006. In addition, Killingsworth is one of the five players in UF school history with 1,000 kills and 300 blocks in her career; as well as finishing out her career with more block solos (65) than any other UF player in the rally scoring era. In addition to her impressive collegiate career, Killingsworth was a scholastic player at Pine Ridge High School (Fl.) and was named Miss Florida Volleyball in 2003 and led Pine Ridge to a state tournament in her senior season. Killingsworth earned a Bachelor of Science Degree in Family, Youth, and Community Service with a Minor in Leadership from the University of Florida in May 2008. She has since obtained a Master of Science in Sports Administration from Delaware State University in December 2014.